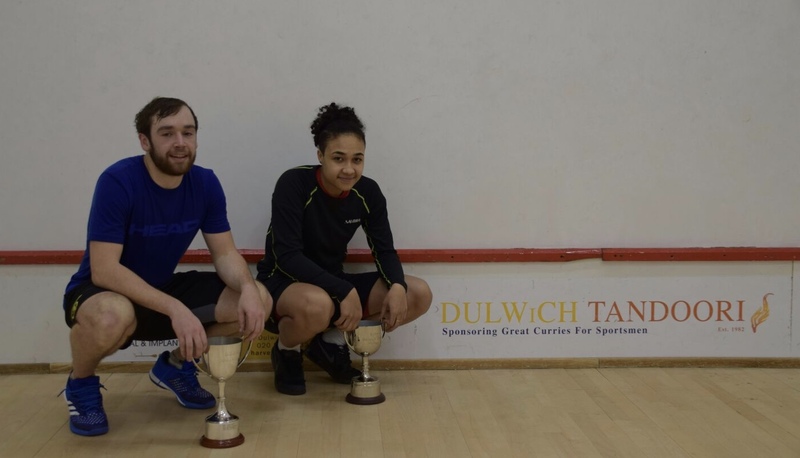 The 2018 edition of the Dulwich Open sponsored by Dulwich Tandoori saw new winners engraved on the trophies as the club once again witnessed some high quality squash. Top seed and World no.76 Angus Gillams was in ruthless form as he swept through the Men’s draw without dropping a game, although Dulwich first team captain Tim Garner went close after a slow start in the Quarter Finals. Gillams’ opponent in the final was Indian World no.113 Abhay Singh. The second seed is now basing himself in Pontefract under the watchful eye of Malcom Willstrop and coped well with a couple of tricky matches enroute to the final. In particular, at 3-8 in the third versus Jamaican Lewis Walters, he kept a level head to pull things back and close out the match in straight games. However, in the final he found an opponent in excellent form and was always on the back foot as Gillams eased through to win and set himself up nicely for the PSA event in Nigeria next week. The women’s title was also decided in straight games, with top seed and World no.93 Kace Bartley beating World no.128 Tory Temple-Murray. The latter is recovering from snapping her Achilles a year ago and looked in impressive form in the pool matches, but found Bartley tough to break down in the final. She got a lead in the third, but Bartley edged her way back, winning a crucial rally at 9-9 to set up a match point which she closed out at the first attempt. The trophies were presented by members Mariam Emanuel and Greg Wallyn. The Dulwich Club was a superb host to the final BSPA event of the regular season, the players commentating how welcoming they had been made to fee. Players were fed and housed for free, and capacity crowds came along to support the tournament. Thanks to main sponsor Dulwich Tandoori, referee Paul Clarke and the members who had helped raise the bulk of the prize fund. 2018 BSPA Dulwich Open sponsored by Dulwich Tandoori, Dulwich Squash Club, London, England.